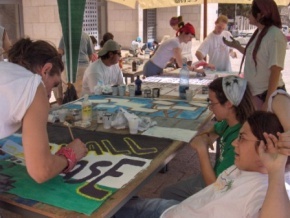 This volunteer project will be carried out in two cities – Hebron and Bethlehem. 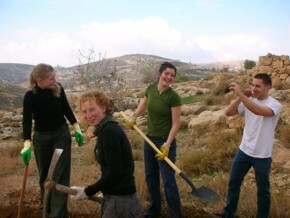 In Hebron, volunteers will work in the Old City and in a local Children’s center, while in Bethlehem, the group will work in the village of Battir and in other parts of the city. The project seeks to protect and renovate old Palestinian sites, and in particular, Battir – an ancient village with wonderful landscape and nature, just outside the town of Bethlehem, which has been inhabited since the Iron Age. Battir has a unique irrigation system that utilizes man-made terraces and a system of manually diverting water via sluice gates. The old monuments and water canals of Battir date back to thousands of years, and the landscape resembles the one of the Babylon gardens. The place has been registered by UNESCO as a World Heritage Site in 2014. – Rehabilitation of old places in Battir, including the very ancient water canals. This special ancient water system is connected to several natural water sources. – Help rebuilding an ancient wall that leads to the very ancient water cistern at the edge of the village. This wall will help locals and visitors reach the water cistern, which is hoped to become a historical and natural tourist attraction. – Working on several locations beside the ancient train railway, which at the time of the Ottoman Empire was the main line that connected Turkey to Palestine. The location of the railway is the borderline between Palestine and Israel. The project will include intensive cultural events that aim at raising the awareness of the volunteers on the history of Palestine and the conflict, in addition to meetings with civil society representatives in both cities that work in social development.